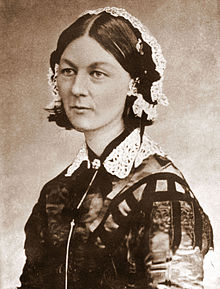 Florence Nightingale is the most recognized name in the field of nursing. Her work was instrumental for developing modern nursing practice, and from her first shift, she worked to ensure patients in her care had what they needed to get healthy. Her Environmental Theory changed the face of nursing to create sanitary conditions for patients to get care. Florence Nightingale was born in 1820 in Italy to a wealthy British family. She was raised in the Anglican faith, and believed the God called her to be a nurse. This call came to her in February 1837 while at Embley Park. She announced her intention to become a nurse in 1844. Her mother and sister were angry at her decision, but Nightingale stood strong. She worked hard to learn about nursing, despite society's expectation that she become a wife and mother. In fact, she rejected a suitor because she thought it would interfere with her nursing career. In 1853, she accepted the position of superintendent at the Institute for the Care of Sick Gentlewomen in Upper Harley Street, London. She held this position until October 1854. The income given to her by her father during this time allowed her to pursue her career and still live comfortably. Though Nightingale had several important friendships with women, including a correspondence with an Irish nun named Sister Mary Clare Moore, she had little respect for women in general, and preferred friendships with powerful men. Nightingale is best known for her pioneering work in the field of nursing. She tended to wounded soldiers during the Crimean War. She became known as the "Lady with the Lamp" because of her night rounds. While nursing soldiers during the war, Nightingale worked to improve nutrition and conditions in the wards. Many injured soldiers were dying from illnesses separate from their injuries, such as typhoid, cholera, and dysentery. Nightingale made changes on the wards or started the process by calling the Sanitary Commission. Her work led to a reduction in the death rates of injured soldiers from 42% to 2%. Nightingale believed the deaths were the result of poor nutrition, inadequate supplies, and the soldiers being dramatically overworked. After collecting evidence that pointed to unsanitary conditions as a major cause of death, Nightingale worked to improve sanitation in army and civilian hospitals during peacetime. After the Crimean War, she established a nursing school at St. Thomas' Hospital in London in 1860. The first nurses trained at this school began working in 1865 at the Liverpool Workhouse Infirmary. It was the first secular nursing school in the world, and is now part of King's College London. Her work laid the foundation for modern nursing, and the pledge all new nurses take was named after her. Nightingale wrote Notes on Nursing (1859), which was the foundation of the curriculum for her nursing school and other nursing schools. This short text was considered the foundation of nursing education, and even sold well to the public. She also wrote Notes on Hospitals, Notes on Matters Affecting the Health, and Efficiency and Hospital Administration of the British Army. Nightingale spent the rest of her career working toward the establishment and development of nursing as a profession, paving the way for nursing in its current form. In 1883, Nightingale was given the Royal Red Cross by Queen Victoria. In 1907, she was the first woman to receive the Order of Merit. In 1908, she was given the Honorary Freedom of the City of London. International Nurses Day is celebrated on her birthday. In this theory, the role of the nurse is to use the patient's environment to help him or her recover and get back to the usual environment. The reason the patient's environment is important is because it can affect his or her health in a positive or negative way. Some environmental factors affecting health according to Nightingale's theory are fresh air, pure water, sufficient food and appropriate nutrition, efficient drainage, cleanliness, and light or direct sunlight. If any of these factors is lacking, it can delay the patient's recovery. Nightingale also emphasized providing a quiet, warm environment for patients to recover in. The theory also calls for nurses to assess a patient's dietary needs, document food intake times, and evaluate how the patient's diet affects his or her health and recovery. Determining a patient's environment for recovery based on his or her condition or disease is still practiced today, such as in patients suffering from tetanus, who need minimal noise to keep them calm and prevent seizures.